I'm not sure when or why I started loving hand made things. Actually, that's a lie. My mom knit sweaters and made clothes for us. Dresses were perfectly fitted in fabric we chose ourselves. I always felt so special wearing those one-of-a-kind garments to school. I can remember sitting on my mom's lap at the sewing machine, visiting the local fabric shop, and as I grew older, learning the skills of creating by hand from her. My mother always said yes to me when I wanted to learn something new. She'd find the materials I needed and would patiently guide me till I'd mastered each skill. I have been a maker since childhood, and no few greater joys than that of whiling away the time with some little project in the works. Working full time has curtailed the amount of time I can spend creating, but the juices still flow prolifically. I have learned to carry a notebook with me always, to jot down any fanciful little thought that pops into my head. That way, I can come back to it later when my children are all past the age of 15. I've become a maker of little things (I confess, I kind of always was) because I can get the satisfaction of finishing something on a regular basis. This post is a shameless display of things I've been making lately and other handmade things made by other people. 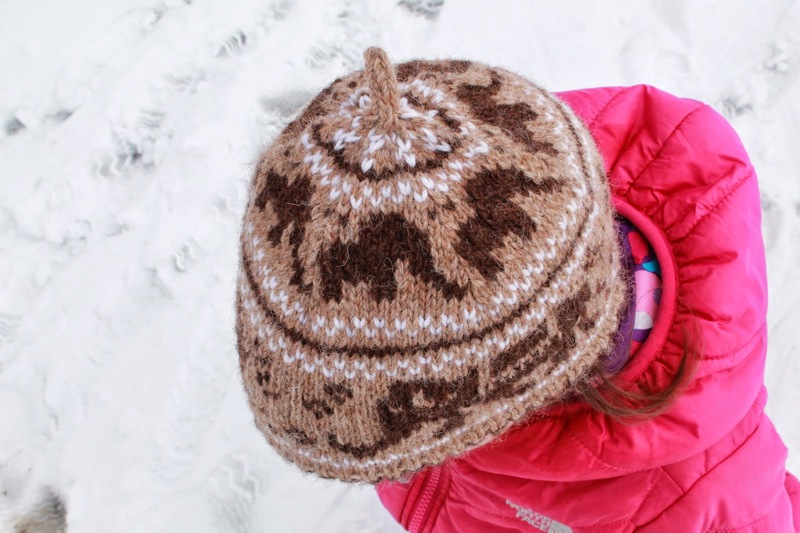 I spent a bit of time in early March creating an elephant hat for Norah. I've always loved elephants since I did a project about them in Grade Two. I used soft, locally-raised alpaca and love the natural colours! It JUST fits, more as a cap or beanie and is fine for Spring. If I were to make it again I might add an extra inch or so to make it fit more deeply (over the ears a bit more). 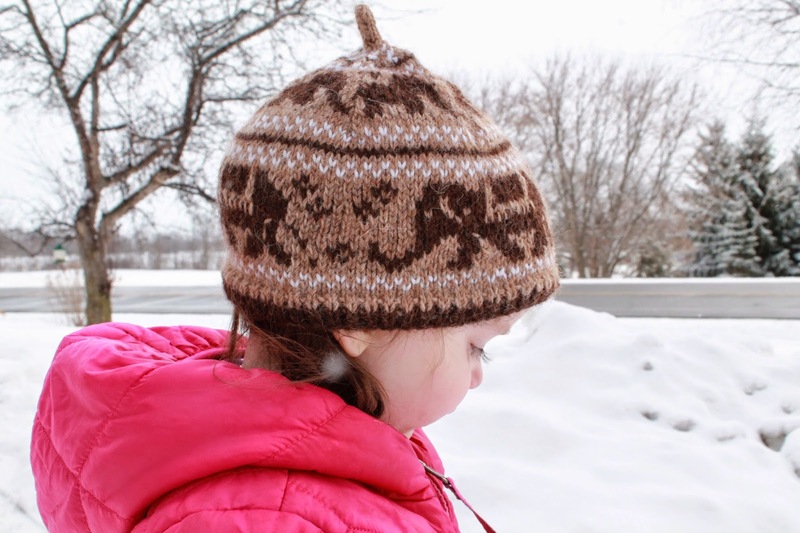 The pattern is a free one that you can find here! I'm thinking I'll add an extra elephant to increase the size, as Margot is clamouring for her own elephant hat. 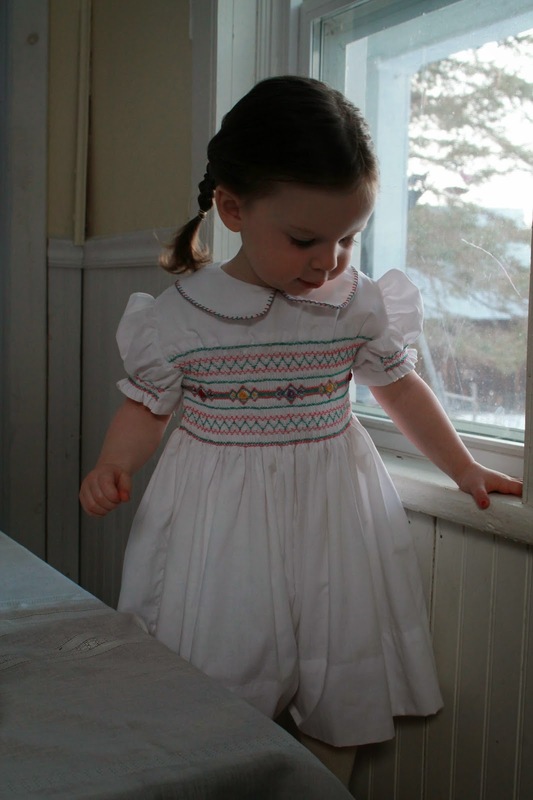 The little smocked dress was a gift for Violet when she was born, from my dear Grandma. Her friend Mrs. Florence Nesbitt made it. 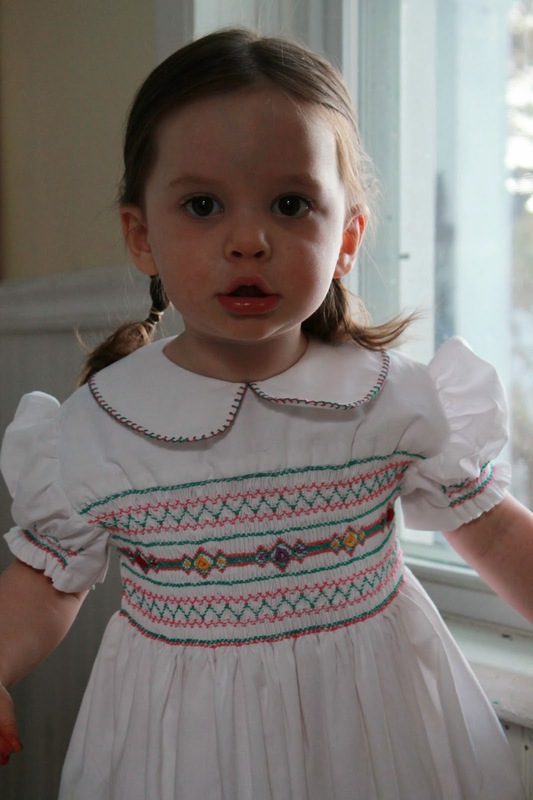 She was in her late eighties when she carefully stitched this beautiful garment for my little girl. The trouble was, I was so afraid to ruin it that I never put it on her! It hung in my closet for years until I finally realised recently that no one could enjoy it there. I took a deep breath and have been putting it on Norah for every special occasion. I'm so glad I did. It fits her perfectly and sets off her dark beauty so well. It makes me think of my Grandma every time I see it. Norah has taken to being Queen Elsa at every chance. 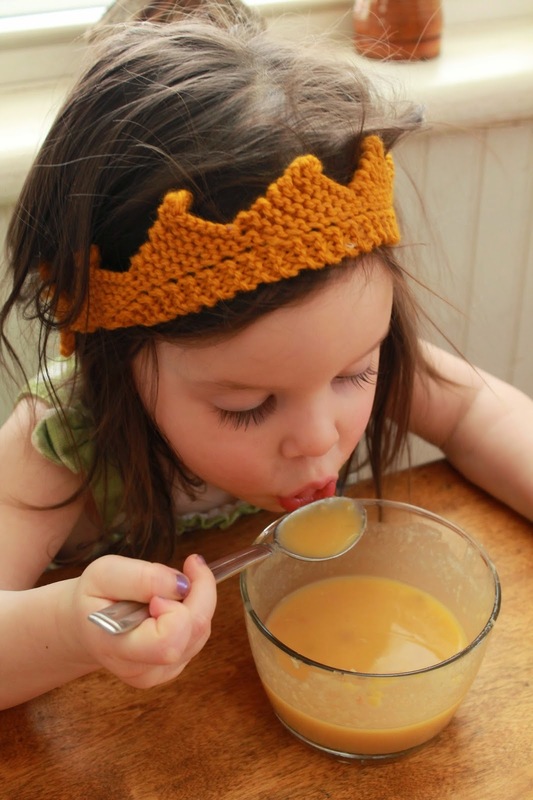 She found this little crown in our toy box, a gift from our dear friend, the Wabi Sabi Wanderer. It fits so beautifully and is the perfect little accessory for play. And for eating homemade pea soup. Now, lest you think I've forgotten my three big kids, I wanted to share their favourite handmade with you. That would be handmade adventures. 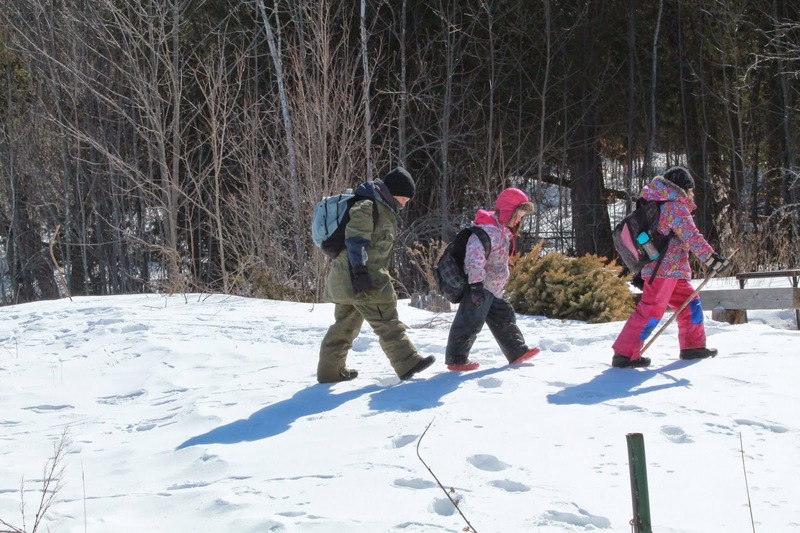 On weekends they pack up their backpacks with snacks, Thermoses full of hot chocolate, jack knives and compasses, flash lights and band-aids, and off they go on quests into the woods. We don't see them for hours, and when they return they have rosy cheeks, scratches, tears in their clothes, and many stories to tell. This might be the best handmade thing in this post. Finally, I wanted to share my latest obsession with you. Inspired by this beautiful artist, I have taken up my needle and thread and have been stitching fabric buttons. They're perfect for my nightly creative time (after 9 pm when everyone is in bed, a load of laundry is in, the dishes are washed, and the lunches are made) because they are small and quick to make. I love the open-endedness of making little things like this. Now I have to figure out where to sew them. The little patches were prototypes because I had no button blanks at home! 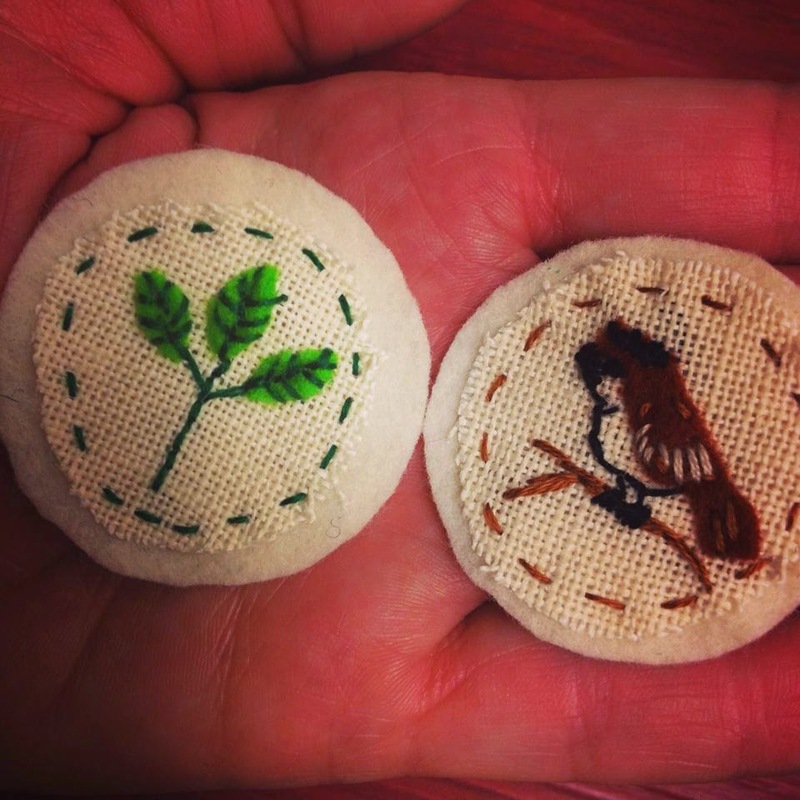 Now I want to get all sizes so I can create tiny artworks with tiny stitches. What have you been putting your hands to lately? I love that hat!! I've been making lots of stamps lately. And doing water color paintings. It's already in the 80's here so my urge to knit is all but gone.